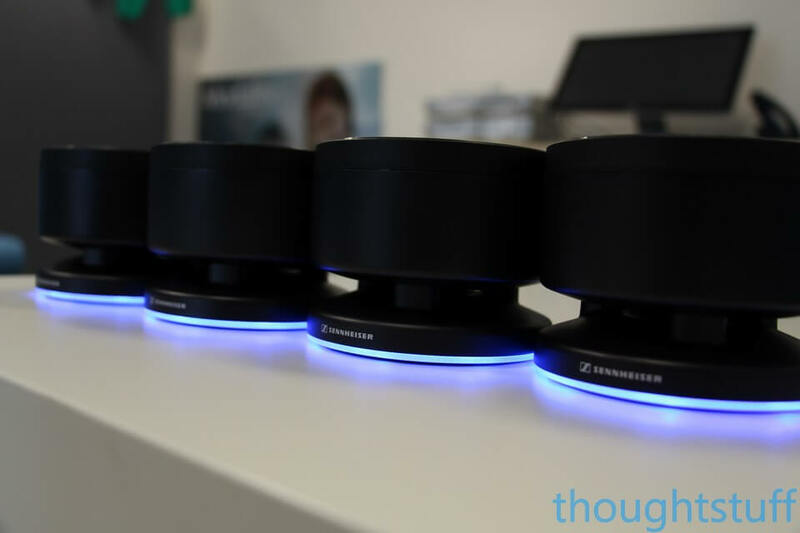 I recently got the chance to get up close and personal with the new Sennheiser TeamConnect Wireless. 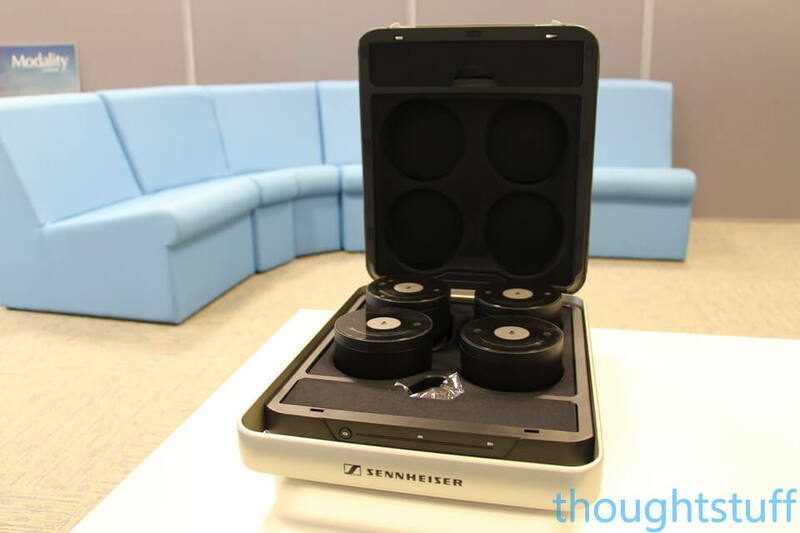 The team at Sennheiser UK were kind enough to lend our office a kit for a week (hey, I guess that’s what happen when you win Microsoft Partner of the Year!!). Here are my impressions after a week of use. The TeamConnect Wireless is trying to solve a tricky problem and provide a product which falls in the middle ground between a dedicated, fixed, meeting-room AV setup and a single-person speakerphone (such as the Jabra Speak 510 or the Sennheiser SP 10/20). The problem is us humans. We like to get together in groups where we can. By definition of the problem this product is trying to solve, those places will not be natural meeting rooms with dedicated equipment, they’ll be round people’s desks or in the breakout area. And despite all the work that’s gone into Microsoft Skype for Business to do active speaker detection, us illogical meat-bags insist of connecting a speakerphone and all talking at once. So. Portable enough to be brought into any impromtu meeting, easy enough for everyone to use, intelligent enough to cope with larger groups of people. It’s a tough ask. Could it do all this, and also impress the hyper-critical Modality Development Team I left it with for week? The TeamConnect Wireless comes in its own briefcase, which also serves as the charging unit for the 4 speaker/microphone units. It’s not that heavy: you could take it with you if you were travelling, but only if you really knew you were going to make good use of it. 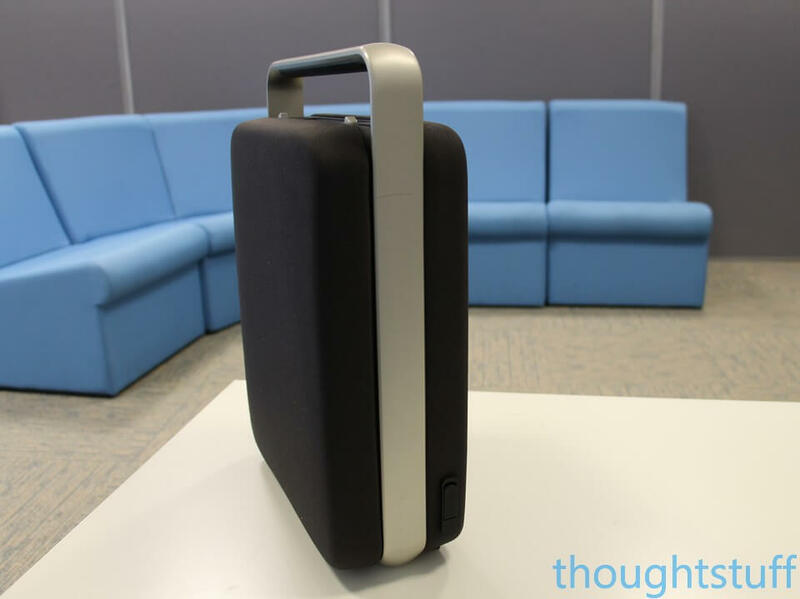 It’s a sturdy case – it reminds me a flight case. The 4 units comprise of a single master and 3 slaves. All the units are the same size but the master has a set of buttons on top to control the system. The kit was delivered by Simon from Sennheiser who was also there to make sure we knew how to use it and make sure we got the best out of short time with it. Like all conferencing equipment should be (but often isn’t) it’s simplicity itself to setup. You take out the master and place it on the table. There’s no On/Off switch, it wakes up when you remove it from the briefcase. You know this because the base lights up – it’s very obvious that it’s alive. There are three input methods: USB, Bluetooth/NFC, or 3.5mm jack. I would imagine most people (certainly in the Skype for Business world) will use USB. You can use the master by itself, or include one or more of the slave units. To add a slave, just remove it from the briefcase and place it on the table. It takes a few seconds (generally around 10-15 seconds) before it lights up and starts working with the master. Each unit comprises a speaker and a set of microphones. There are individual volume touch-controls on each unit, and a large mute button which mutes all units simultaneously. To remove a unit, just place it back into the case – the act of putting it in the case is what disconnects it and turns it off. It’s a clever, intuitive idea. You can add or remove units midway through a call without any crazy noises, static, dropped speech etc. 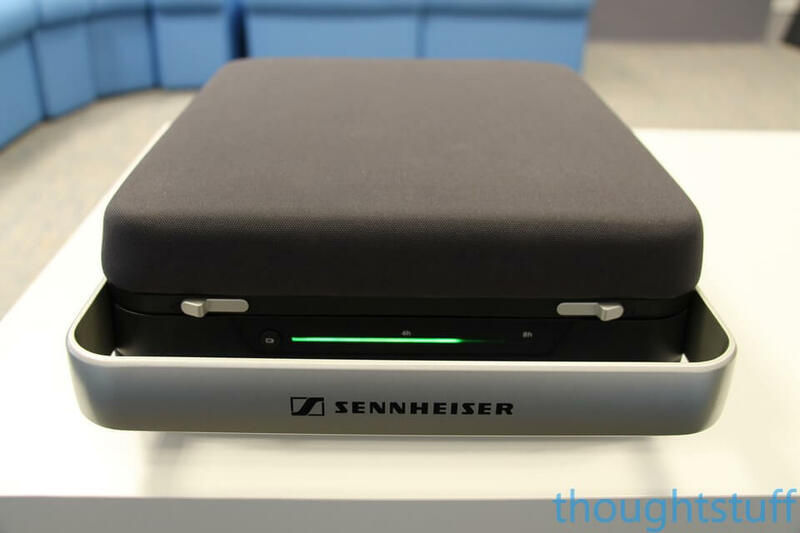 It’s clear that Sennheiser have really listened to how people conference, and what the pain points are. This is a system that ‘just works’ and is built around how people conference. Build quality is good. This feels like a premium product. The units are weighty and feel solid. The case is nicely constructed of metal and rubber on the outside and fabric lined protective padding on the inside, and contains compartments for all the cables you might need to charge and use the device. The only criticism is that the tops of the units are high-gloss plastic, which invariably means they show up smears and fingerprints (you can see this in the photos because I’m not a professional product photography so I didn’t wipe them!). We used the system for just over a week. As a team we tend to make a lot of calls involving 4-8 people locally with 1-2 people remote. We’d previously used small speakerphones for these meetings and feedback from the remote participants was that whilst the call quality was sometimes OK, the speakerphones didn’t cope well with multiple people talking, or sudden and rapid changes in who is talking. In fact, we found ourselves artificially constraining how we talked, trying to make our conversation optimal for the speakerphone. However, whenever things got interesting or involved we would always forget, and the remote person would loose parts of the conversation as the speakerphone got confused about who the active speaker was, and tried to noise-cancel them out. It was for these reasons that I thought we should trial the TeamConnect Wireless. The TeamConnect Wireless is good, and is definitely a step-up from a smaller 1-unit speakerphone. Sound is richer and feels more “wide-band”. Microphone pickup with multiple people isn’t flawless, but it’s pretty impressive. On balance, it’s a clear improvement in experience for meetings. However, an unexpected side-effect from trying out the TeamConnect Wireless is that it made much more obvious the short-comings of our meeting spaces. Our meeting rooms are predominately bare walls and glass, with a high echo-factor. This wasn’t so obvious with cheaper speakerphones – the “weakest link” was more likely to be poor microphone pickup or flaky speaker recognition. Now however, echo is our new limiting factor. This isn’t the fault of the TeamConnect Wireless – in fact it’s almost a compliment in that it’s exposed that we have a new problem which isn’t the device, it’s the environment. I think once we sort this out then we’ll be able to enjoy some really good meeting experiences. All other feedback was that the device is excellent, in terms of ease of use, setup and build quality. The team enjoyed using it and missed it once it went. If you hold a lot of meetings with 3 or more local people in a variety of different locations, and you’re feeling the pain points of the smaller speakerphones, then you should definitely give the TeamConnect Wireless a look. It’s relatively expensive for a portable speakerphone solution, but cheaper than a dedicated in-room experience and more portable. It might not solve all your problems, and you may find that you move your problem to something else (such as in our experience) but overall it’s a good bit of kit – and it manages to straddle the two camps of individual devices and room-based devices admirably. I have had two sets, one set was warrantied after just a few months, the second set is now doing what the first set was having problems with. We have an 8 hour meeting, and use these for the whole day. About half way through the day, they start screaming noises much like an old fax modem at a very loud volume. I have updated the firmware, and it still seems to have the problem. These were very expensive to have this kind of problem repeatedly. When it happens I have to drop them back into the charging station to kill the loud noises, (even if I dock the Master) We are really disappointed in this system. I have tried to work with the distributor, but they have quit responding to my calls.